While you are designing fashionable outfits for your paper doll, don't forget to make some matching accessories. What paper doll wouldn't love to sport a pair of sneakers, a book bag, or a baseball cap? Instead of drawing or gluing hair on your paper doll, why not use one of these hat patterns and create a variety of wigs for your doll. 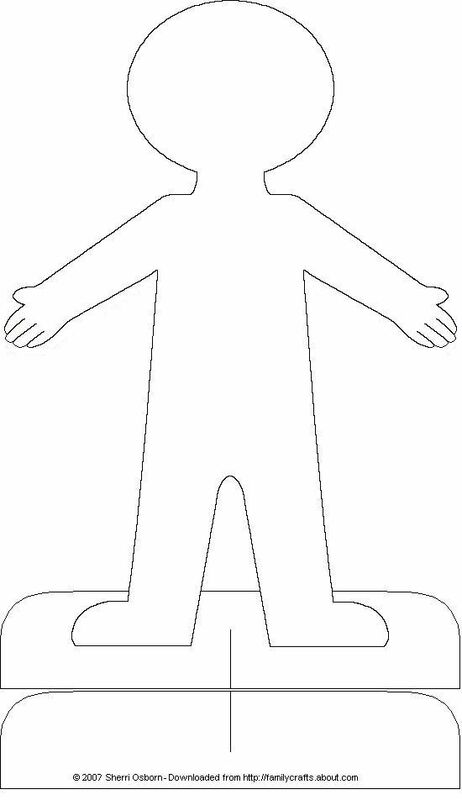 Print out and color or decorate this paper doll body cutout and then browse through and print out a variety of clothes items and accessories. Click on the paper doll image above to get to the full-sized version. Depending on your computer, you can click or right-click on that image and choose to either print it or save it to your computer (you can find saving and printing help here). Print out the free template and then color it and cut it out. You can also color it in before you print it by using a graphics program. Printing on cardstock will give you the best results, but you might also want to consider making your doll, clothing, and accessories out of printable magnets, printable stickers, or even felt or craft foam. To make your paper dolls and their clothing and accessories last longer, consider laminating them after coloring but before you add any dimensional elements. For more printable paper doll items, go to the Design Your Own Paper Dolls page. Print out and color or decorate this cowboy hat for your paper doll. Depending on your computer, you can click or right-click on the image above and choose to either print it or save it to your computer (you can find saving and printing help here). Print out and color or decorate this baseball cap for your paper doll. Print out and color or decorate this sun bonnet or straw hat for your paper doll. Print out and color or decorate this rain hat for your paper doll. Print out and color or decorate this winter stocking cap for your paper doll. Print out and color or decorate this headband for your paper doll. Print out and color or decorate these sandals for your paper doll. Print out and color or decorate these winter boots for your paper doll. Print out and color or decorate thhis pair of girl's dress shoes for your paper doll. Print out and color or decorate these rain boots for your paper doll. Print out and color or decorate these shoes for your paper doll. Print out and color or decorate this book bag for your paper doll. Print out and color or decorate this purse for your paper doll. Print out and color or decorate this pair of mittens for your paper doll.